Front row: Tom Fulton, John Mitchell, John Fraser, Torquil Cowan, Graeme Mackenzie. Hi George. I remember these pictures being taken (despite being much younger than yourself! - I was in 2nd year when this picture was taken.) I have a similar set from my own age group taken on the same day, must look them out and put them on the site. Looks like John Mackay. Hamish and yourself all went to the same haidresser !!!! Who is between George MacKay and Iain Allison? I am almost certain it is Hamish Munro (Alness) between George R and Ian Allison. 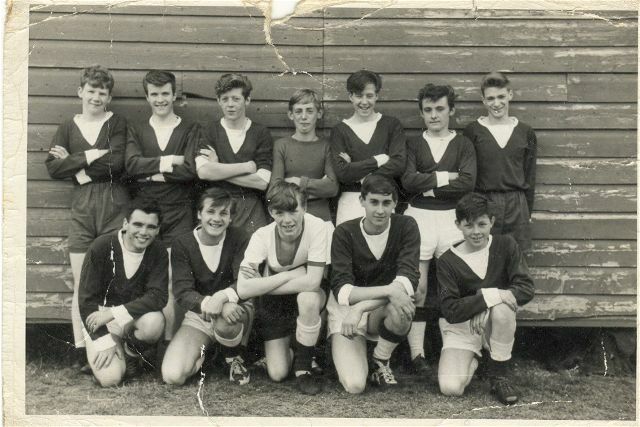 Hello Graham - have you any other photos of the school teams you and I played in together around 1962-1964? - it would be nice to see them. You may remember you were Captain of the under-15s and I was Vice-Captain and even at that stage we played for the senior team. Aye, Jock Watt had an eye for a good player. Hello John - I've got quite a few lying around - I will look them out and put them on the site. I was speaking to Jock recently and was making the same point to him !!!!! I have this very photograph at home! Nice to see your comment John. I was 15yrs when this photo was taken. As we are all of a certain age (Graham and I -64yrs - are probably the youngest in the group) I wondered if we were all still around. I have got very sentimental and nostalgic since I turned 60 in 2009 and often look at such photos and ask myself - "I wonder where they are now?" I am down in Ellon, what about you and of course James? Having made the 700 mile round trip to see County versus Partick I think we still have a chance of getting a game!! Hello John F ... On the question of where they are all now, here is my best shot maybe others can add information or correct any errors. Still living in Easter Ross I am pretty sure on George R Mackay, Tom Fulton, John Mitchell, Paul Tonberg, Kenny Forrest, Hamish Munro and myself. John MacKay (married to Sandra sister (younger) of George R MacKay is living near Linlithgow. George Mackay is living in the York area. Ian Allison I do not know where he is now and sadly Torquil Cowan who I think was living near Chester passed away a couple of years ago. You just got me on the 64 John but just by two days and I suspect you are a bit nearer the pension age!!!!! As John mentioned above, the older we get the more our thoughts turn to earlier days. I have been retired for over 2 years now but still living in NW Glasgow (Maryhill). I pass through Invergordon fairly regularly to visit my aunt near Dornoch. Although not in this photograph, I am in touch with Fraser Dryden and John Clark, living in Cambuslang and Ayr respectively, and we meet up a couple of times a year. Graham/John. I think Ian is still in Glasgow and unless he moved recently, Hamish is in Aberdeen. I will make no comment on age! George. ... Hamish was the one I wasn't sure about so your info along with Iain's reply just about accounts for everyone. On the age front generally and a sobering thought to us all I reckon this photo was taken in June 1964 so we are now just about to hit 50 years ... frightening! Hi guys, I am also retired and live at Arboll near Portmahomack, Kenny lives in Balintore and George R lives in Barbaraville. Graham, looks like our respective teams will meet up a bit sooner than we would have liked. Indeed John, if anyone had told you what was about to unfold 5 years ago they would have been locked up as insane! Still I am sure your bhoys, sorry slip of the keyboard, I of course meant boys, will be able to get back to the Premiership via the play-offs! Graham, George is correct, I do live in Aberdeen and have been here since 1977. I retired in March last year. Still get back up to Alness quite often to see family and friends. Can't find a photo of Jock Watt on this site, but he trained this team. Sad news - Jock died on Sunday night (7 April 2019), aged 84. Sad news Ian. Met Jock last September in Strathpeffer and he was very cheerful despite suffering from a debilitating lung disease. We had a grand hour of "all our yesterdays". Very sad to hear of the passing of Jock. He touched so many lives in so many ways and in so many different spheres of life. He was a truly wonderful teacher and generations of ex pupils will look back and recall Jock with so much affection , respect and gratitude. Most of all though he was an outstanding man and so many will feel privileged to have had their lives touched by Jock Watt. Graham, I am so sad to hear of Jocks passing. Your words encapsulate everything that I could have used to describe Jock. Many people will remember him as a great local and PE teacher but us older guys will also rennet his venture on Grampian TV’s - Pick of the North talent show which he won. It was so long ago I cannot remember what year it was. So very sorry to hear of Jock's passing I can only concur with Graham's comments, a true Highland Gentleman, it was a privilege to be one of his pupils and also work with him when he became Director of Leisure and Recreation for Ross and Cromarty District Council.